Hello everyone! I am sorry that I have been away from the blog, but we have been working on our middle school musical (Disney's The Little Mermaid, Jr.) which opened tonight. I should be going to bed, but I received a response from Showbie about some questions/requests that I had e-mailed them about, and I was amazed to learn that the program does some of the things that I have been wishing for! I do a pretty good job of reading their news releases, and I missed these improvements, so there is a good chance that you might have missed them, too. Showbie is a great solution for paperless 1:1 iPad scenarios. It isn't a full-blown Course Management System like Schoology or Edmodo, but it does some things those systems cannot (and vice-versa). I have blogged about Showbie and my uses for the app in the past–and I will do so again in the future. 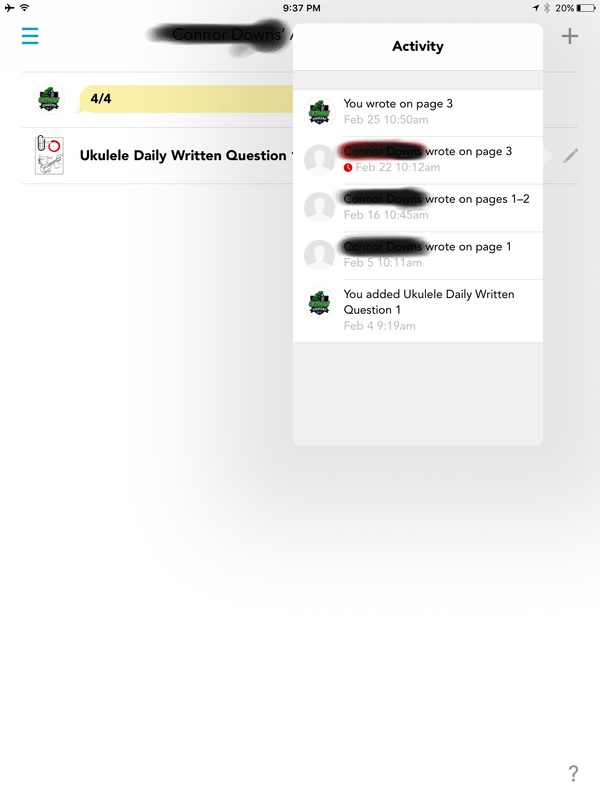 We use Showbie for just about everything in my choir program (and we use resources like Google Forms for those things that Showbie doesn't do as a CMS, such as self-grading tests). While there is so much I love about Showbie, the two game changing features are that students can create accounts using their GAFE information (Google Apps accounts), which saves time and forgotten passwords. 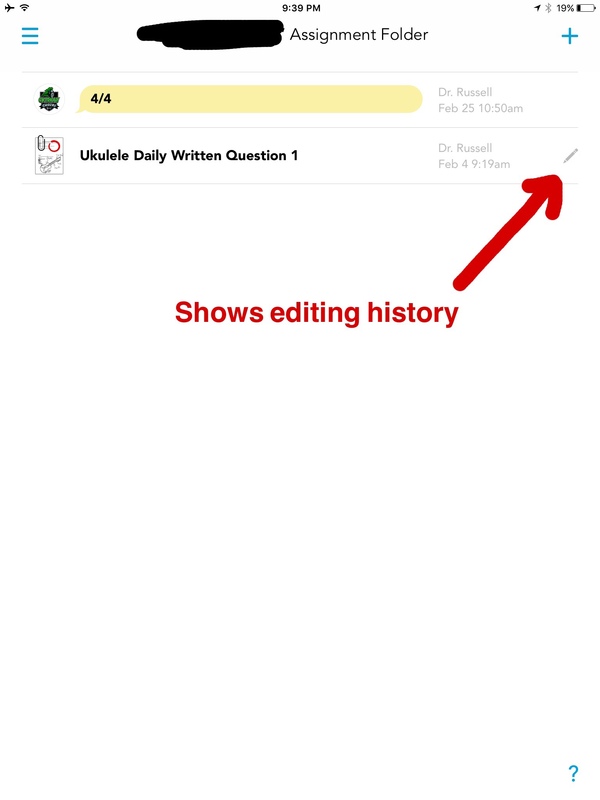 The other is that students can do their work right in the app, click “Done,” and they are done. 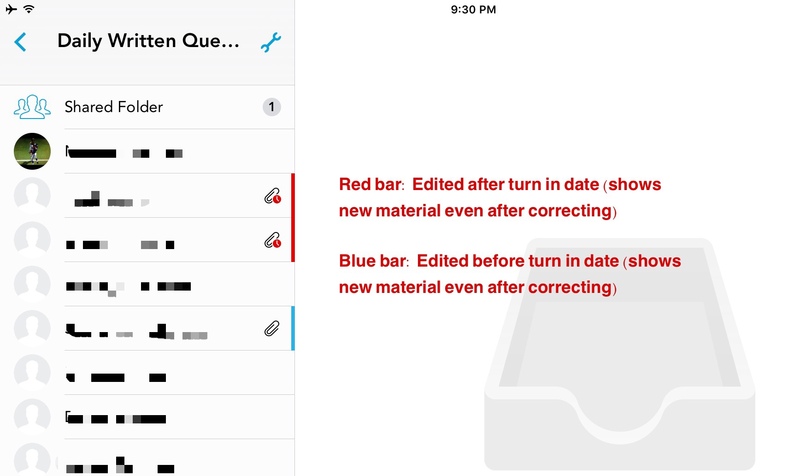 You don't need another app (such as Notability) to edit worksheets–it can all be done right in the app. At any rate, what I have been longing for is a way to see if a student has edited an item AFTER I have corrected it. While I would still like to see (collected) assignments flagged in the class view when a student as has updated an assignment, you can go into each assignment and see some things that I have never noticed before. Second, there are blue and red bars that tell you if a student has edited something before it was due (blue) or after it was due (red). As in the past, a paper clip shows that a student has done work in the assignment (side note: it is always good to pull down the list and refresh the view, as otherwise you might miss paper clips as they don't automatically update), a red clock shows that an assignment was turned in late, and a red partial circle shows that you corrected it. One of my beliefs is that students should be able to correct work, even if overdue. Ultimately, I want them to complete the task and demonstrate their mastery over that topic. If that means they turn it in late, I am okay with that. Our school has a policy which gives a student an automatic 50% AND we have to accept late work until the last day of the trimester (both of these probably go to far, and kids take advantage of that). The problem I had in the past was that there was no easy way to see if a student had revised an assignment so that I knew that I had to correct it again. It turns out that there is. Those blue and red bars appear even after something is corrected (see below). As I mentioned, I need these bars on the assignments themselves so I know to look for corrected work. Otherwise, with 330+ students in 10 classes, I'll never look through each individual assignment for every student in every class. I currently have a late work slip that I ask them to complete so that I know to grade late work. That works “mostly” okay, but there are kids who don't (or won't) fill out a late slip. At any rate, these features are really important to me, and I didn't even know they existed. If you have iPads and use Showbie, hopefully you knew about them already–if not, now you know!